Other Games: Staggers - The Art of Luckmanship | Strut! Easy to learn….hard to put away! Just one round and you’ll be hooked! 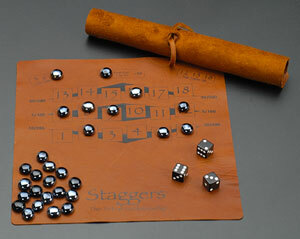 Staggers is a low-intensity social dice game involving two or more players. The object of the game is to score the most points possible during each turn. Players score points when a die or dice combination matches one or more numbers on the field of play. Players use glass markers to cover those numbers as they compete. Purchase 1 Staggers game for $22.00, or buy 2 or more at $19.75 each (Save Over 10%).